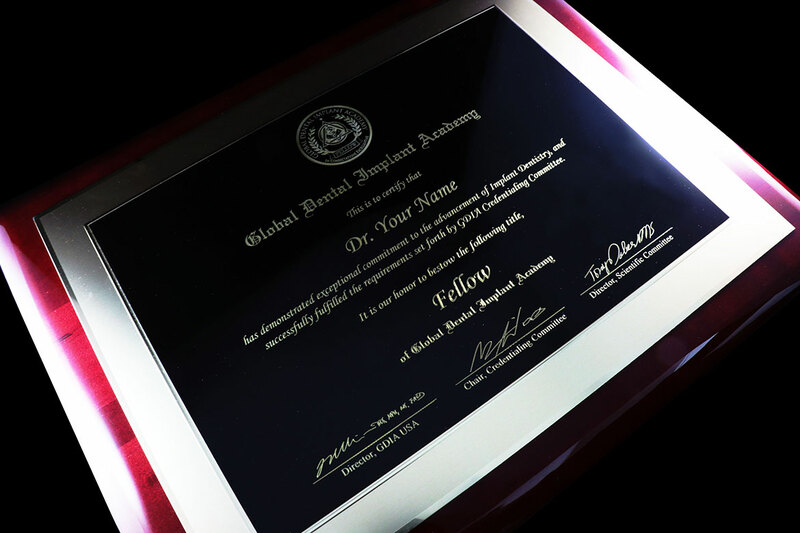 GDIA Fellowship is established by the Board of GDIA Credentialing Committee to pursue our core values, “to strive for excellence in Implant Dentistry and to better serve the community”. By acquiring the basic eligibility requirements of GDIA Fellowship, each applicant will demonstrate that learning is not a light task, but a lifelong exercise. However, maintaining the core values as a lifelong discipline requires collaboration of like-minded professionals who are committed to sharing the highest level of meaningful education in Implant Dentistry. Our Fellowship Credential will help you become involved with many dedicated clinicians and become the leader and expert in Implant Dentistry. Each completed case, regardless of the number of implants, counts as one case. Full mouth reconstructive surgery and restoration may be submitted as two separate cases, surgical & restoration. All cases must include Pre- & Post-operative x-rays and clinical photographs of final cases. Please submit as much data as possible, with documents such as pre-, surgical, post-clinical photographs, CT scans, treatment plan, laboratory work data, and/or patient consent forms. First, the applicant must make the payment fee of $450 for reviewing and processing the application. Applicant may either pay the fee online (by clicking the “JOIN NOW” button below) or provide the card payment information on the application form. Applicant must download the application form, fill it out, and send it to our office by either emailing it to info@gdia.com, faxing it to our office at 323-617-4145, or mailing it to 6 Centerpointe Drive, Ste. 600 La Palma, CA 90623 (please select one SEND-IN option). Applicant must send in all other additional materials listed in the “Requirements” Section.